Engaging Chicken Salad - A recipe from Savor California, the online showcase for extraordinary gourmet foods and beverages from California. Cover chicken breasts with olive oil and sprinkle with Engage Organics Go-Grill-A-Rub Hot (or Mild Seed-free Go-Grill-A-Rub, if you like less heat). Put breasts in a plastic bag and coat them well. Marinate them for several hours or overnight. Grill chicken breasts over medium-high heat for 6-7 minutes per side depending on thickness. Or bake at 350 until they register 165 degrees. 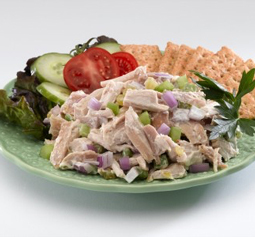 Cut chicken into bite-size pieces and put into a bowl with celery, red onion, It's-A-Dilly and GarlicSaltless. Meanwhile, in a small bowl, whisk together mayonnaise, lemon juice, mustard and pepper to taste. Add chicken and mix, stirring gently until combined. Refrigerate for several hours or overnight. Serve with crackers, or in a nest of lettuce, or tucked between whole grain bread for a nutritious meal.